Make a Pie or Help Serve for Pie & Politics! 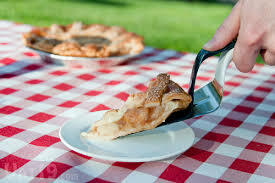 The 18th Pie and Politics will be held at Big Top Chautauqua in Bayfield on Wednesday, July 23rd. The Alliance for Sustainability has asked local citizens to speak about creating thriving communities. Concessions and exhibits open at 5:30 p.m. Key note speeches will start at 7:00 p.m. Following the program, participants will eat delicious pie and engage in lively discussion. The League of Women Voters/Ashland and Bayfield Counties will again organize the pie social. This is a big task and we will need your help. We will need volunteers to donate pies. Volunteers are also needed to plate and serve the pies. If you are willing to donate pies, please contact Dee Johnson. If you are willing to serve the pies, please contact Gail Syverud. Thank you so much for helping to make this community gathering a successful event.